On Sunday 7th August, Warwickshire and Birmingham Wing hosted the Air Training Corps' 75th Anniversary Torch as part of the UK-wide relay involving every unit in the organisation. 84 (Coventry Airport) Squadron were involved throughout the entire 24 hour period supporting the route through the Wing on foot and even in the air! The Torch was formally presented at midday to Warwickshire & Birmingham at the National Memorial Arboretum in Staffordshire where it was paraded with all the other Wing banners for the handover of the torch from the Wales & West Region to our Central & East Region. The torch then spent the afternoon in Birmingham City Centre where the local squadrons had organised a Climbing Tower, Music Displays and the chance to sit in a Scale Model of a Spitfire. Then it was Coventry’s turn. Cadet Sergeant Phoebe Jenner from 84 Squadron had the privilege of flying the torch into Coventry Airport from Birmingham International Airport as part of her Private Pilots Licence. She set off from Coventry in the 2 seater Cessna late afternoon and amazingly managed to negotiate the much bigger aircraft at Birmingham even sharing the runway with a RAF Airbus A330 Voyager which was still taking off as she landed! Sgt Jenner flew a miniature version of the torch back to Coventry with ease alongside her instructor Richard Pedley from Almat Aviation and landed perfectly to greet a crowd of cadets from local squadrons and the Lord Mayor. Sgt Jenner remarked that “it was quite daunting flying into Birmingham but I am so proud to have been allowed to do this and contribute such an important aviation element to the torch relay”. Safely landed, the torch spent time at 84 (Coventry Airport) Squadron in the sunshine where cadets had the opportunity to take photos with the torch and with Lord Mayor Lindsley Harvard who chatted with cadets and staff before heading off into the city centre for the next leg of the journey. Cadet Corporal Jake Garrett had the privilege of traveling with the torch accompanied by the Lord Mayor in COV 1, the official chauffeur driven car for the Lord Mayor. At Coventry Cathedral, Cadet Corporal Dylan Chauhan met the torch with the 84 Squadron banner to witness the handover to 8F (Wyken), 163 (Coventry Phoenix) and 2286 (Arden) Squadrons. Further along the route at the War Memorial Park it was back to Sergeant Jenner to take up the banner and parade along with the four Coventry Squadrons as the torch made its way through the park whilst Corporals Garrett and Chauhan did a quick change into walking gear so they could join a small group of cadets walking the torch from Coventry to Kenilworth, to portray the Air Training Corps' involvement in the Duke of Edinburgh scheme. 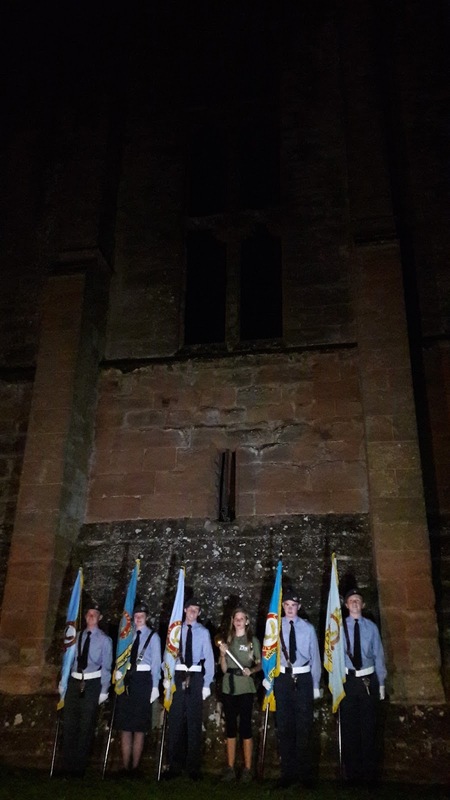 Finally, at 2200 hours, the torch was handed to the Kenilworth squadron in the eerie darkness of Kenilworth Castle. The torch was up early on the Monday morning and visited Warwick Castle, Shakespeare’s birthplace and Stratford city centre before making its way to Wellesbourne airfield where the remaining county squadrons paraded with it and the historic Vulcan bomber. 84 Squadron’s involvement finished when Sergeant Jenner joined the other Wing banners at Bruntingthorpe airfield where the torch was handed over to the next Wing. A truly busy 24 hours! For full photographs, check out the Squadron Facebook Page. Written by: Flying Officer Rosie Robinson RAFVR(T) and Mrs Jessica Jenner, Civilian Committee Secretary and Parent.